Pictures from the triangle Cologne - Aachen - Düsseldorf in the far western part of Germany. There's quite a bit of traffic variety, in no small part due to the international trains running into Belgium and the Netherlands and a sizeable industrial base in the nearby Ruhr area. 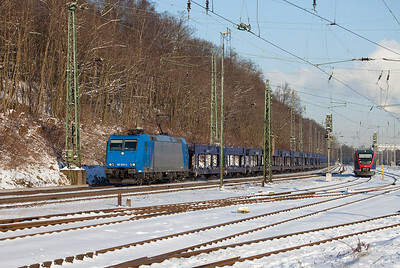 185 520 on lease to Crossrail leads an empty auto train operated for Mosolf Auto Distribution through Stolberg. 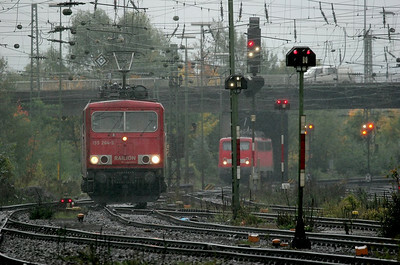 HGK DE13 with a tank train in Köln-West. This is the last surviving operating unit of only three MaK-built DE1024s. The units were built for heavy mainline service in non-electrified territory in northern Germany but suffered lots of problems, including a number of fires, throughout their career. They bounced around private operators after DB didn't like them and ended up with HGK. Two of the three have burned again and are stored unservicable. 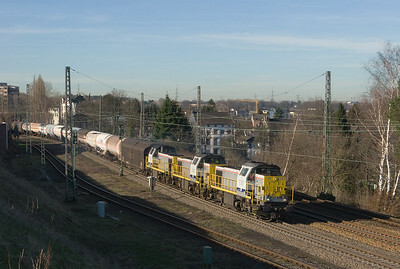 Köln-West is a hotspot of freight and passenger activity. If you ever come to Köln and can only spend a couple of hours foaming, this is the place to go. 185 581 received a special Ewals paint scheme to advertise one of Crossrail's largest customers. Here it is seen approaching Aachen Hbf with the DGS 40162 on a hot and humid day in May. The train has swung off the freight main due to construction activities and runs through a platform track, nicely showing off the decals on the engine's flank. The Euregiobahn operates passenger service on a number of main and branch lines in the Aachen area and into the Netherlands. The class 643 Talents have been a resounding success with riders, offering frequent, comfortable transportation. Here a pair of them are seen accelerating away from the station stop at Kohlscheid enroute to Eschweiler-Weisweiler via Aachen. 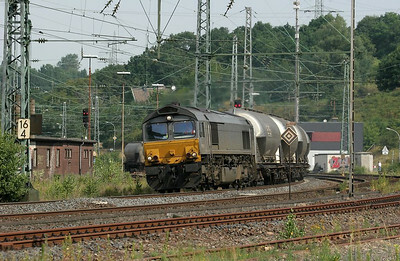 Gremberg yard in Köln is the major freight hub in the area. A large number of freight trains are serviced here daily, and a good number also start and terminate here. In addition, the north-south main line skirting the yard hosts a good variety of trains not making setouts/pickups. The north yard throat is the busier end and has nice sight lines, including Gnf tower in this view. Here's 155 181 with the Ambrogio train TEC 40084 (Gallarate/I - Muizen/B) bypassing the yard on its way to Aachen and on into Belgium. HGK regularly operates a semi-famous (in the area, anyway) hazmat train of hydrogen cyanide. Special idler cars are employed at each end. Here it passes through the flyovers close to Mediapark. This location offers nice views and is located just a short walk north of Köln West. Eschweiler is located on the line between Aachen and Köln. This means most of the Belgium-bound freight traffic passes through there in addition to the highspeed Thalys and ICE trains and a good deal of commuter traffic as well. In summary, it's busy. The area south-east of the main station (Hbf) overlooks a reverse curve offering good sight lines both directions for most of the day. Shadows can be a problem during winter, though - this shot was taken in February. Here we see R4C 185 517 lead an eastbound train of tank cars it picked up in Aachen. 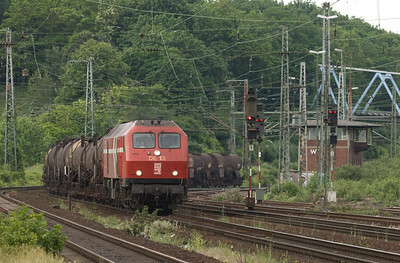 R4C usually utilizes their class 66 diesels only west of Aachen and prefers electric traction east of there, though there are always exceptions of course. 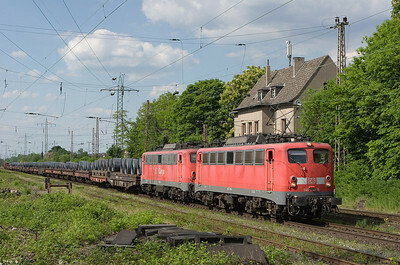 155 259 westbound with the 40158 (Milano/I - Bierset/B) in Eschweiler. 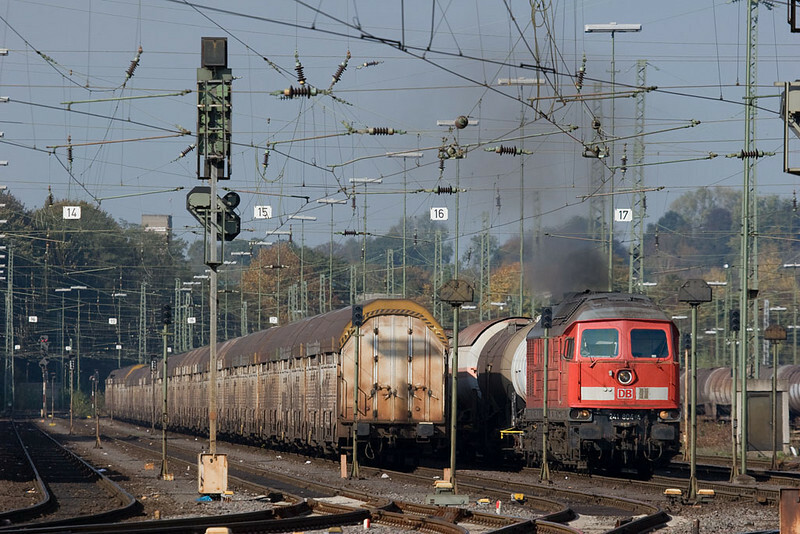 As DB Schenker culls their fleet of older units rendered surplus by the slacking economy, these venerable Co' Co' survivors from ex-East Germany are acutely endangered. Rumor has it they as well as the 50+ year old class 140s are to be sidelined soonish. So getting a good shot of a rather clean unit is all the more satisfactory. 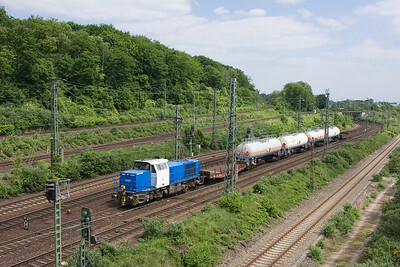 During 2008 B-Cargo was operating trains starting and terminating in Gremberg with multiple-unit lashups of class 77 diesels, by way of Welkenraedt and Aachen. 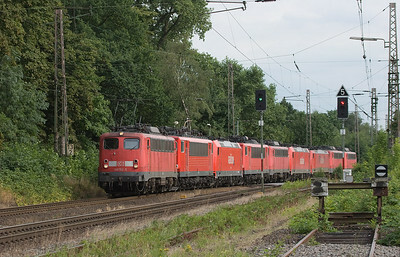 Here 7787, 7860, and 7776 bring FE 44521 through Eschweiler eastbound. 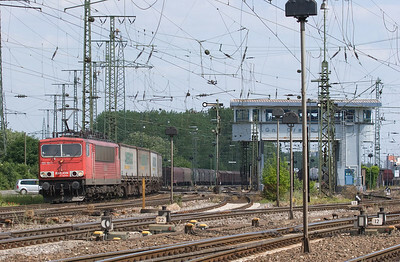 140 799 and 140 838 team up to move a coil train southbound through Lintorf, a small place between Düsseldorf and Duisburg that sees a near-constant parade of freight traffic from and to the Ruhr area and the ports in the Netherlands. 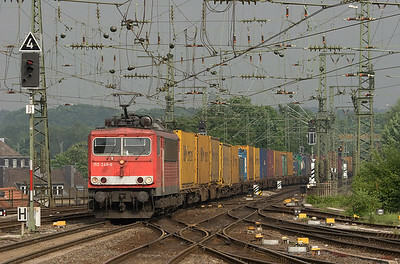 During 2008 the nearly half-a-century old standard electrics of class 140 were still a common sight on all kinds of heavy freight trains, oftentimes doubleheaded. That's the abandoned station building in the background. 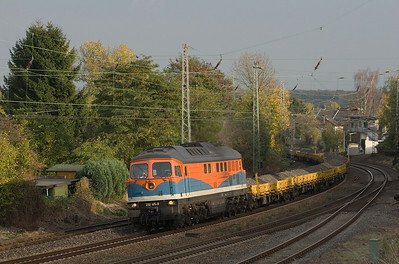 The five "super Ludmillas" of class 241.8 were a fixture of freight operations in the Aachen area for several years, powering trains over the short distance between Aachen West and Montzen only. Even though they were refitted with relatively new prime movers they were known to smoke profusely. Here 241 804 accelerates a mixed freight out of the yard under the signature emissions plume. The units were displaced by the new Cobra Traxxes in December 2008. Just so you don't think it never rains in the Aachen area - it does. You get a choice of horizontal drizzle, showers, cold rain, torrential downpours. During one of the latter, these electric engines shuffle between the yard tracks and the engine storage area. The gloomy conditions make the signals stand out nicely. Good thing one can sit in the car at this location and shoot out the window! Nordbayrische Eisenbahn 232 105 heads westbound under threatening skies with a ballast train in Eschweiler. This engine arguably wears the weirdest paint scheme on rails today. Ehf tower is visible in the background, still manned. Composite of three night shots taken in Herzogenrath. 189 067 with a very short empty limestone train 48566 (Oberhausen - Hermalle s/Huy) in Kohlscheid. Westbound Thalys in Stolberg Hbf. 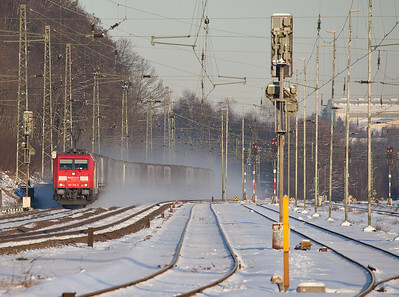 Rurtalbahn V107 departs Stolberg Hbf with a cut of cars bound for the lead smelter in Stolberg proper. There are 2-3 weekly trains shuttling imported lead ore between Antwerp/B and here. In Belgium the train is run by Trainsport, a Rurtalbahn subsidiary, and looks like this. The V107 is a rebuilt class 212 ex-DB diesel-hydraulic. 185 305 hustles west with the Ambrogio intermodal train DGS 40242 (Gallarate/I - Oorderen/B) through Stolberg. One of only two non-intermodal trains operated by DLC in this area is the PET shuttle between Antwerp and Poland. 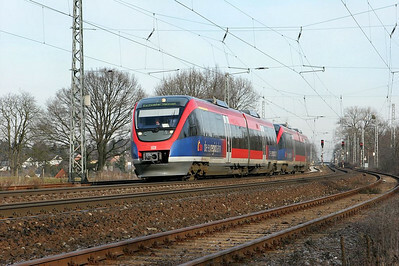 It comes into Aachen from the north, over the line from Düsseldorf, and is seen here passing at speed through Herzogenrath. After the DLC-Crossrail merger, electric traction has taken over in a big way relegating the fleet of class 66 "sheds" mostly to service in Belgium and the Netherlands. 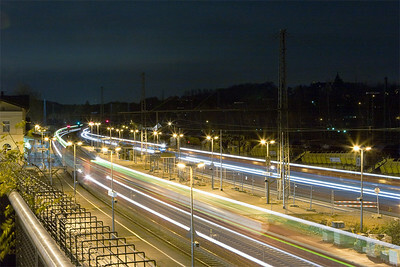 Another shot from Aachen Hbf, showing what can happen on a busy main line. Almost eclipsed by the commuter train, 7869 + 7853 + 7867 bring the FE 44538 (Gremberg - Antwerp/B) westbound through Aachen Hbf. 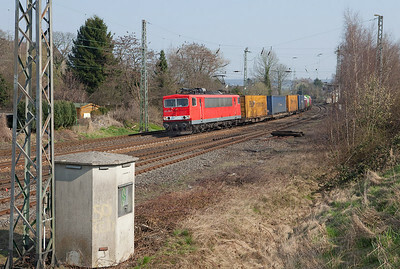 The run-through freights to and from Gremberg were the only scheduled occurrences of tripleheaders in the area and ended when the class 28 Traxxes took over in early 2009. Chemical traffic to and from the giant DSM complex in Geleen-Lutterade/NL provides interesting opportunities for photography. 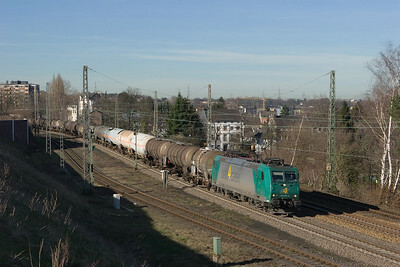 This train of compressed gas tank cars has crossed the border at Herzogenrath and now runs southbound through Aachen towards Köln. 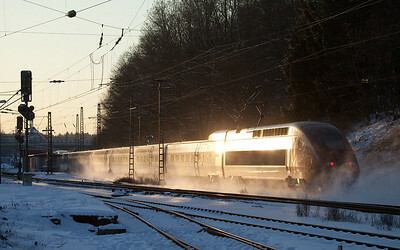 Here it passes through Kohlscheid at a good clip. A good portion of the traffic from and to Belgium is intermodal. Into 2009 the ex-East German class 155 Co-Co electrics bore a good portion of it. Here 155 249 leads the TEC 40086 (Oleggio/I - Zeebrugge/B) through Aachen Hbf. 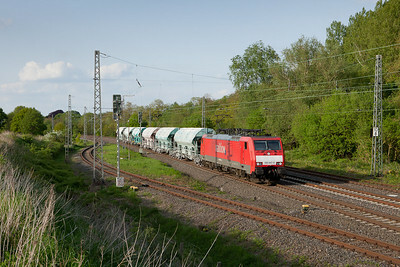 140 512 has the honor with this power equalizing move through Lintorf northbound. Even though theoretically all engines are painted the same body color, this photo shows just how badly the paint fades, given enough exposure to UV radiation. 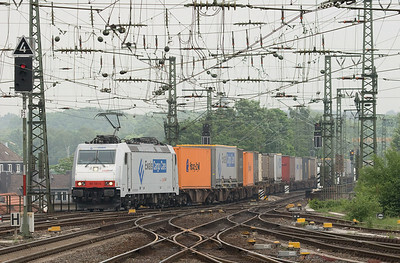 SBB Cargo runs a number of intermodal trains into Aachen every day. 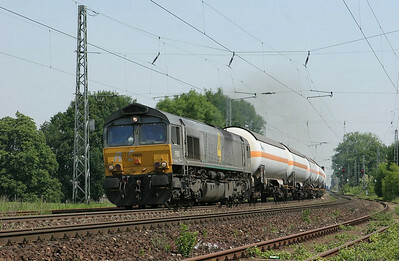 B-Cargo forwards them into Belgium with their own power from Aachen West onwards. 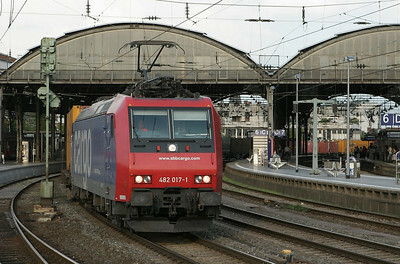 This shot from the west end of Aachen Hbf illustrates how the two freight mains run through the train shed, making train watching from the platforms quite convenient.